Kang "Blank" Sun Gu is a Korean League of Legends player. 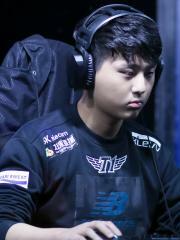 Currently, Blank is ranked #147 in highest overall earnings, and #16 in highest earnings for players from Korea, Republic of. Before his 18th birthday, Blank was awarded $25,528.80 in cash prizes from 3 tournaments. 4.56% of his total prize money was earned before April 30, 2016. Out of the 15 tournaments where Blank received a cash prize, the largest was $338,000.00 from LoL 2016 World Championship on October 29, 2016. His 1st place finish makes up 60.41% of his total prize money won. On October 29, 2016, Blank reached $100,000 in total prize money won with a $338,000.00 cash prize from his 1st place finish at LoL 2016 World Championship. Prize money from 6 tournaments got him to that point.